As a shape, hexagons are one of the best, in my humble opinion. With six spectacular little sides I'll always love stars but hexies can translate into anything including pumpkins! And since fall is right around the corner it's time to start thinking all things Autumnal and pumpkin spice. As such I added a little pumpkin spice decor to my living room and I'm really happy with the big, bold look! Now the initial goal was to use reclaimed wood but I couldn't find any in my area because I couldn't find anyone to purchase pallet wood from and there was certainly nobody willing to give it to me like back in Oklahoma. I decided to make my own rustic looking wood using inexpensive cedar dog eared pickets I spied at the front door of the lumber store. In the end I was able to make 4 really pretty dang big, "pallet" pumpkins out of 4 pickets that ran me $2.15 apiece plus one piece of 1"x2"x8" of cedar lumber that was $3.12. That's less than $12 for some pretty large fall decor, which I'm happy with, but that can be even cheaper if you can actually find inexpensive pallet wood to DIY with. Since the look for this project is rustic the process is incredibly simple. Nothing needs to be bang on perfect so don't stress if your cuts aren't exact. I swear it will still look awesome in the end. 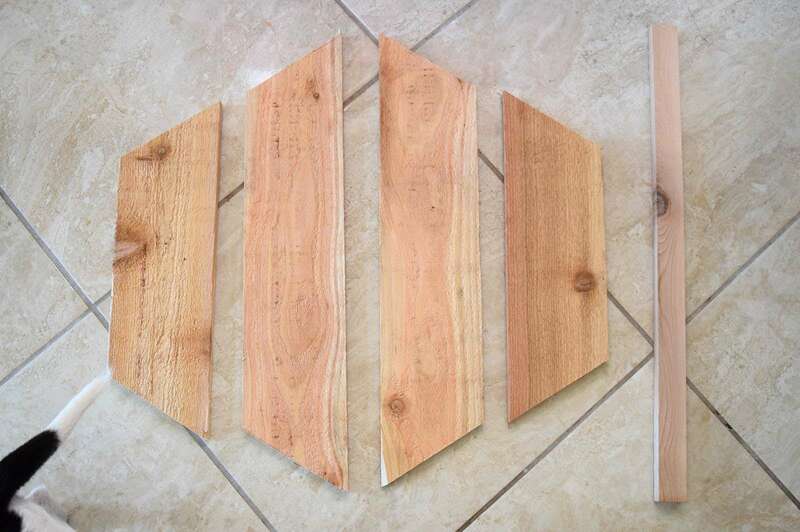 To get started take your first slat of wood, be it cedar or pallet, and cut a length with 30° angles on each end. These will be opposing angles as seen in the pic above. 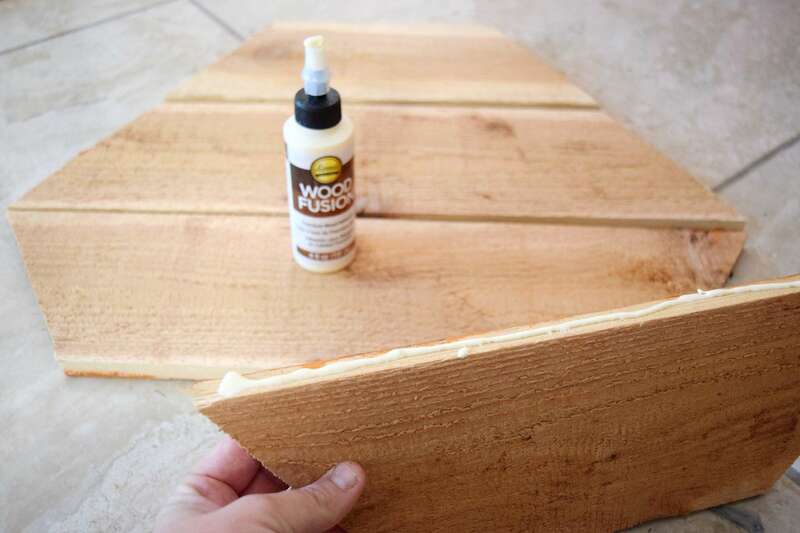 Take your first piece of wood and hold it up to the next piece to cut Mark where the longest part of the board meets the new board and then continue your angle from there. Using those 2 pieces cut 2 more just like them. 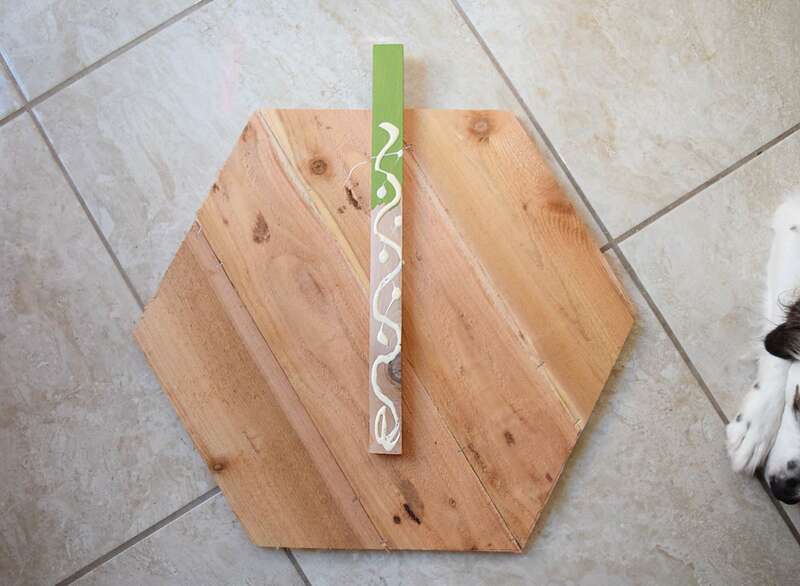 Measuring all of the pieces as they form a hexagon shape, take your 1x2" board and cut a length long enough to support the backside of the shape and stick out over the top 1-4 inches as the "stem". I used a power mitre saw but you can also use a mitre box for an inexpensive way to get your wood cut on the angle. 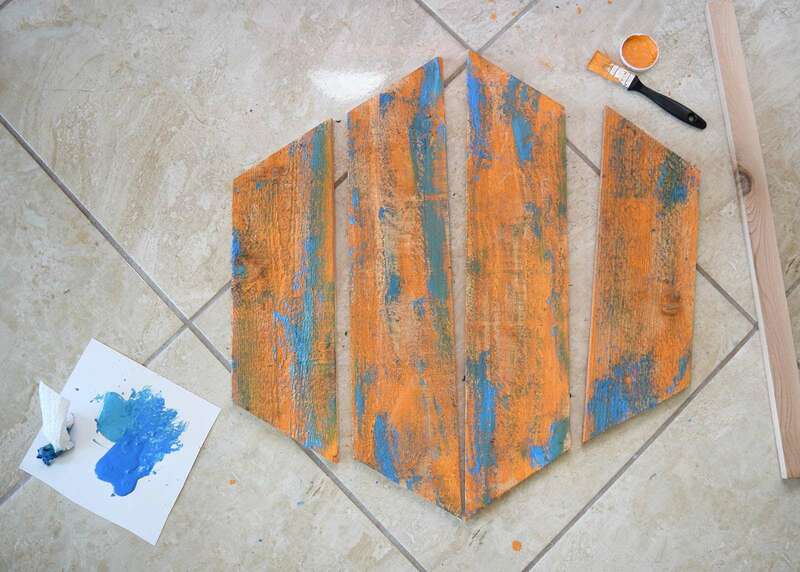 To give our wood some faux age first brush on some orange paint. Don't cover every little bit of the surface to help keep with the aged look. An inexpensive chip brush works really well for this imperfect application. 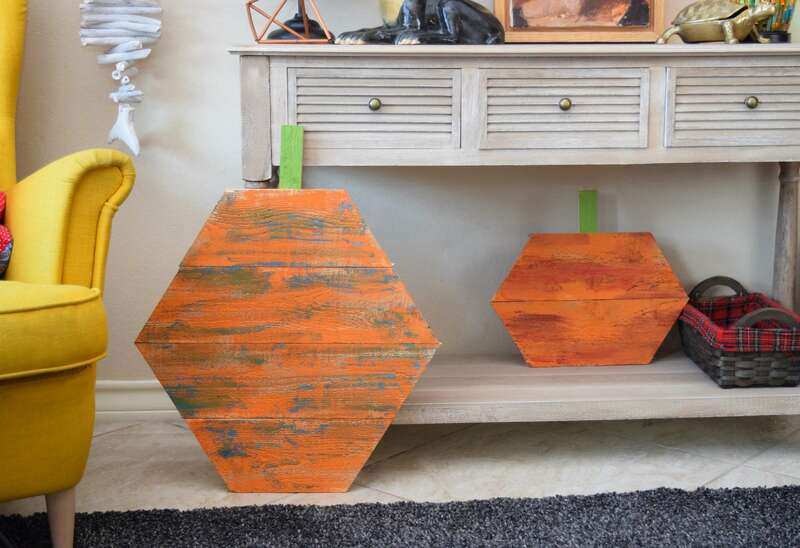 While your orange paint is still wet rub on some accent color in random places. I used a paper towel and 2 colors of blues/teal acrylics. 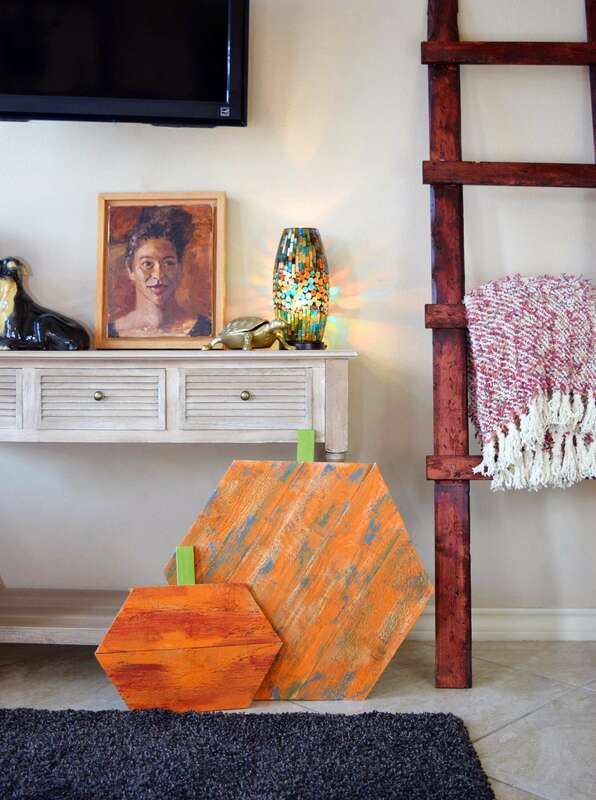 Allow all of the paint to completely dry and then go over with one more imperfect and quick cover of orange to finish the look. 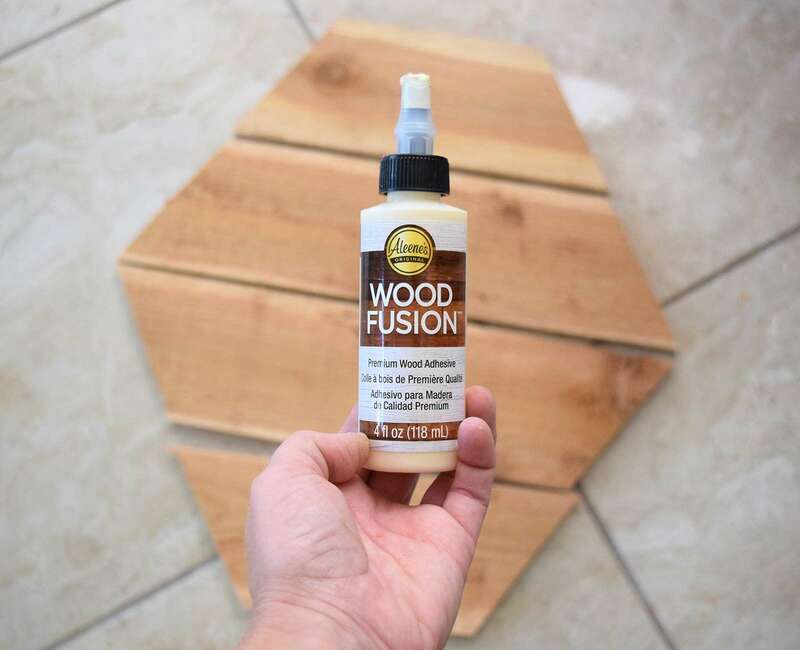 Once all of the paint is completely dry we can bust out our Aleene's Wood Fusion and continue building each pumpkin. Turn your pumpkin over so that the painted side is on the ground. 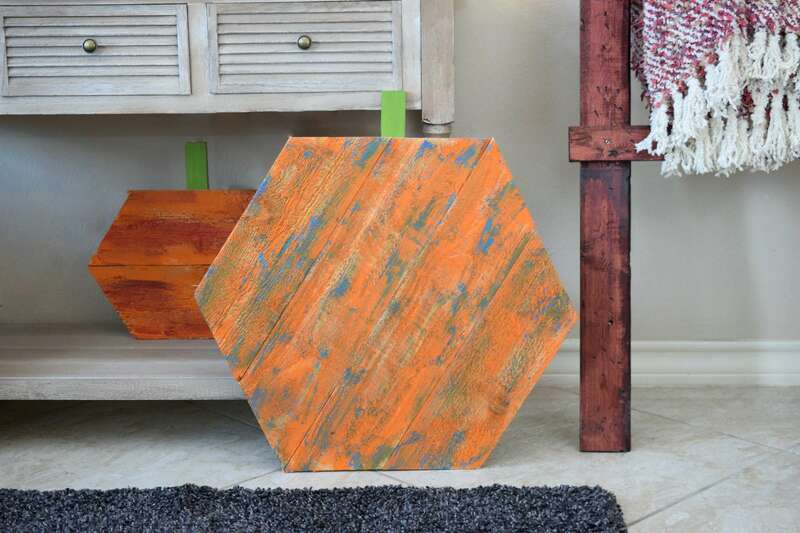 Apply a strip of Wood fusion to the top of the bottom piece of your hexagon shape and stick it to the next board up. Continue adding glue until all of the pieces are together. 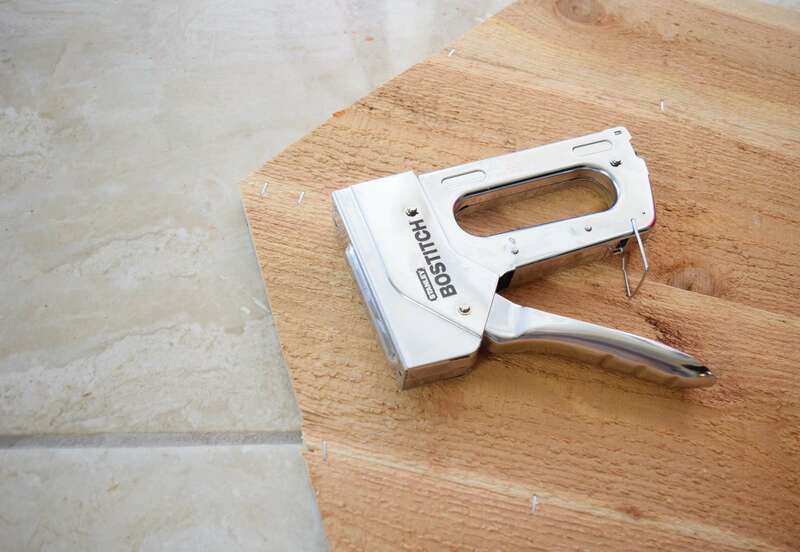 While the glue is still wet use a staple gun to tack the strips together from the back side. Carefully flip the piece over and allow the glue to dry, overnight is best, with the painted side up. 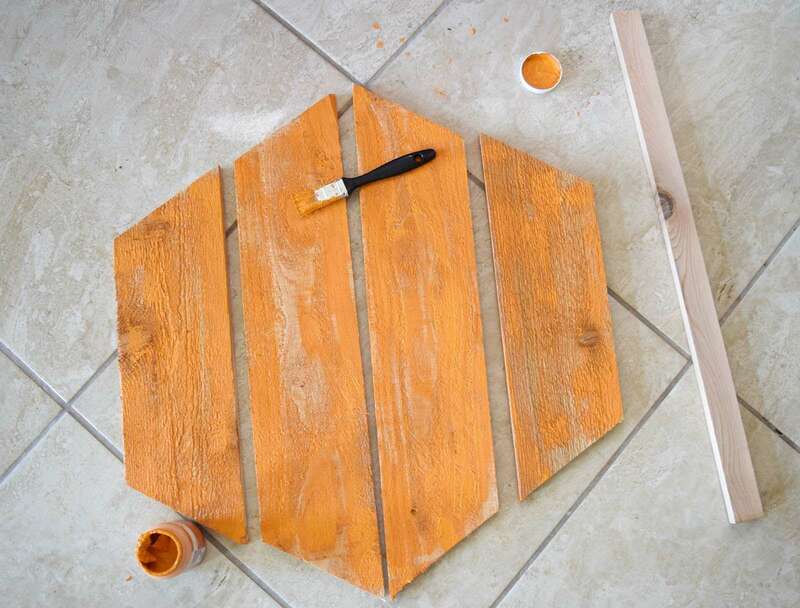 Paint the top portion of your "stem" piece green and apply a healthy amount of glue to the bottom portion of the wood. Glue the stem onto the back of the pumpkin, using weight like books (or in my case my dad's birthday present :) to apply pressure allowing the stem to dry in place. After a few hours the glue should be cured to the point that moving the pumpkins around is totally doable without any damage. Most of my pumpkins are 4 pieces of angled wood cuts pieced together. My more symmetrical shape I was able to turn on its side so that the slats are on the diagonal instead of horizontal. I also made one "tiny" pumpkin using only 2 pieces of wood and I love the difference in their sizes when placed together. In the end this project is quick, easy and quite inexpensive. And being simple pumpkins these guys will be able to hang out in my living room for all of fall and will even do triple duty working well with my Halloween and Thanksgiving decor. Pretty cool, right?